Lamar Towers ... facade works set to commence. RIGHT: An artist’s impression. With the award of a contract for the challenging façade works on the SR1.73-billion ($461 million) Lamar Towers, work on the iconic towers on Saudi Arabia’s Jeddah Corniche has entered a crucial phase in its construction. The SR200-million ($53 million) contract for the building envelope works will be undertaken by the UAE-based Technical Glass and Aluminium Company, a leading provider of aluminium, glass, steel, GRC (glass reinforced concrete), marble, granite, and precast solutions for building external envelopes. Its scope of work includes the design and supply of glass and aluminium and all the façade works including the unitised curtain-walls, precast, stone panel and the cladding panel. The gold-coloured façade of the prestigious towers will reflect the essence of its name Lamar – literally translated from Arabic is ‘molten gold’ – which was inspired by the way the setting sun will reflect off the glass walls. The project is being jointly developed by Saudi Arabia’s Lamar Investment and Real Estate Development Company and Drake and Scull International (DSI), a regional leader in integrated design, engineering and construction. Drake and Scull Construction (DSC) KSA is undertaking the general contracting responsibilities on the project. Work on the façade is scheduled to start shortly with the landscaping works set to begin in early 2016. 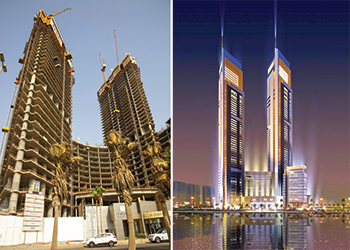 The Lamar Towers occupies a 34,800-sq-m plot offering a total built-up area of 409,770 sq m on Jeddah Corniche. It comprises two high-rise towers sitting atop a curved podium. Tower T1 and T2 measure 322 m and 293 m in height and comprise 57 and 49 storeys respectively. Upon completion, the mixed-use commercial and residential towers will offer a luxury lifestyle, offering stylish housing and a gateway for modern and contemporary businesses in the kingdom for international companies. The landmark project has suffered a number of setbacks since it was launched way back in 2008. Work on Lamar Towers halted in 2009 after which the project was restructured and refinanced in 2013 attracting elite regional and international investors while a new development company was assigned to manage the project with DSC appointed as the main contractor. DSC has completed the concrete works on nearly 65 floors on both towers combined, as well construction works reaching five levels of shared parking, and 12 levels of the shared podium structure, said a Saudi Gazette report. Commenting on the façade award, Bakr R Nazer, the CEO and managing director of Lamar Investment and Real Estate Development Company, says: “We are confident Technical Glass and Aluminium possesses the necessary skills, knowledge and manpower to deliver the outstanding quality of work and finish that a project of this complex scale demands. To date, DSC has used more than 24,000 cu m of concrete and 6,500 tonnes of steel on the project. On the award of the façade works, Nazer says reaching the stage of awarding the curtain-wall construction is a tremendous achievement for both companies and marks the transition into the next phase of the march towards the completion of construction activities on the two towers. Khaldoun Tabari, CEO and vice-chairman of DSI, says the creation of the curtain-wall is a major stage in the construction lifecycle of any project, and that Technical Glass and Aluminium Company has proven its credentials in the regional market through its stellar work on some notable projects and enjoy a reputation of delivering quality, professional external structure solutions.